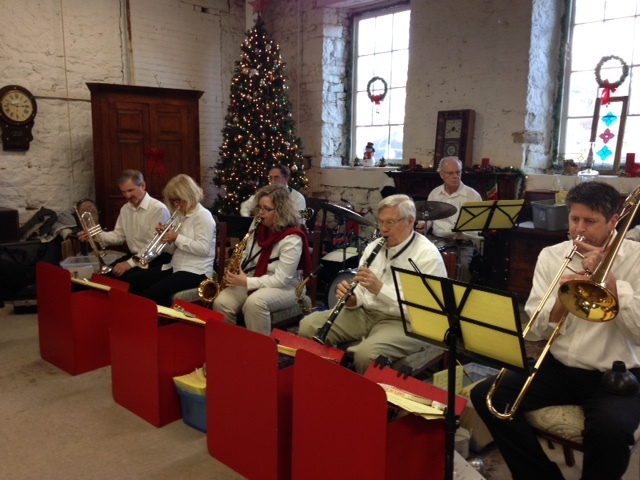 This small seven piece orchestra was formed by eter Banting in Ancaster in 1999. The group's instrumentation includes: guitar and banjo, bass, drums, trumpet and flugelhorn, alto saxophone and clarinet, tenor saxophone, and trombone. Its members live in the Golden Horseshoe area. They are all experienced professional musicians, who have performed in a variety of musical settings, including pit bands for musicals, marching bands, dance bands, concert bands and symphony orchestras. They got together for the pure joy of playing. 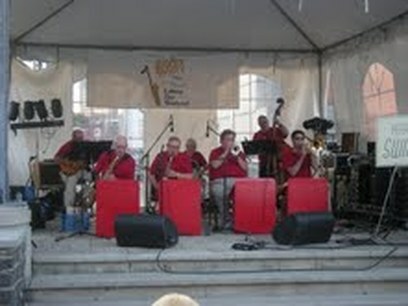 In the photo above the SWINGTET performs at Hamilton Mustard Festival. The SWINGTET plays the happy, buoyant and melodic popular "standard" tunes of the mid-twentieth century, the big band music that was so captivating during and after the Second World War, and the ever-popular Broadway Show melodies. Their music is bouncy and lyrical -- the stuff you can hum, sing or whistle, such as "C'est Si Bon," and "Fly Me to the Moon." Their music is infectious. In addition to swing music, the SWINGTET also performs Polkas, Dixieland, Waltzes, Latin music, and Novelty numbers. The SWINGTET plays them all! Check out the "Swingtet Melodies" top right corner tab for a listing of some of the names of tunes in our repertoire. The SWINGTET has performed at fairs, street festivals an park concerts, at cocktail parties and receptions, has provided dinner music, entertained at dances and weddings, birthdays and anniversaries, and at commercial functions such as store anniversaries, sales meetings, grand openings, customer appreciation days, and employee recognition events. See "where we perform" under the "About" tab, above. 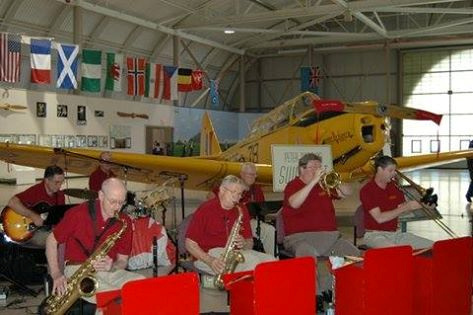 As members of the Golden Horseshoe community, the SWINGTET is committed to helping worthy causes. Among those that the band has aided are: Living Rock Ministries' Soupfest (for endangered youth), the Alzheimer’s Society, Breast Cancer and the Canadian Cancer Society. The SWINGTET is happy to help deserving organizations raise funds. They have entertained at a black tie gala for the Sir Frederick Banting Legacy Foundation in Alliston, Ontario, that generated more than $100,000. and an outdoor BBQ fundraiser ​at Cottonwood Mansion in Selkirk, Ontario. ​We also played for the 2015 Christmas Concert of the Hamilton Gay Men’s Chorus.